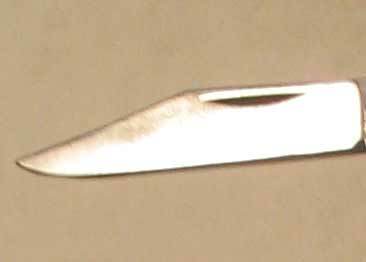 A blade is the flat, sharp part of a tool or weapon used to cut or stab, such as a knife or sword. Most blades have handles. 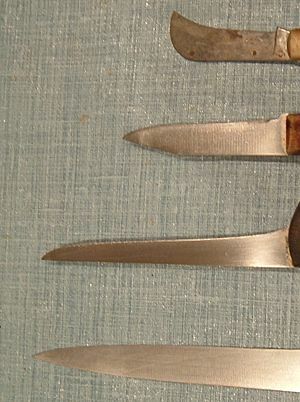 Blades can be used to stab, cut, or separate things. It can also be the top part of grass or the leaf of a plant. Blades come in all different sizes and shapes, sharpness and materials. An Anglo-Saxon "broken-back" seax from Sittingbourne in Kent, inscribed in Insular majuscules ☩ BIORHTELM ME ÞORTE ("Biorhtelm made me") and ☩ S[I]GEBEREHT ME AH ("S[i]gebereht owns me"). Blade Facts for Kids. Kiddle Encyclopedia.